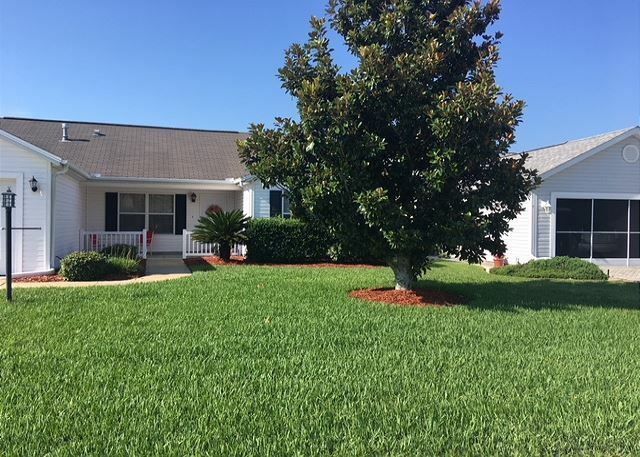 The Villages, Florida United States - New Listing! Village of Glenbrook | RE/MAX PREMIER REALTY Inc.
Three bedroom two bath home with enclosed lanai and a GOLF CART for your pleasure. This home has a king in the master, queen in the guest and a sofa bed in the third bedroom which is set up as an office with a tv. Dining can seat 8. Seats at the breakfast bar for two. Large walk in closets in the master bedroom with dual vanity and tile shower with glass door. Large living and dining area, flat screen tv in the master and in the living area. Washer and dryer inside in utility room Gas cooking in the kitchen! Nice porch out front! Two car garage! This is just in and will go quickly for season so don't let it get away. A guest from SUWANEE, GA United States recommends this vacation rental. great location, well stocked, nice golf cart! We hope to return!